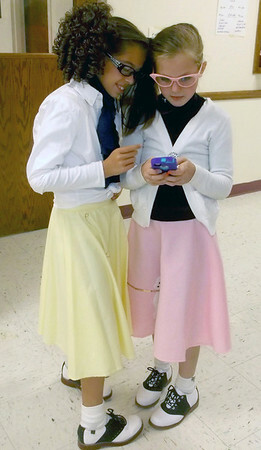 Isabellla Kronewitter, left, and McKenzie Wittenberg, both fifth-graders at Central School in Effingham, show how old school can meet new school at the annual Stewardson Costume Contest and Raffle at the Stewardson Community Building. The girls are modeling 1950s attire while playing an electronic game. McKenzie’s dad Rick grew up in Stewardson. The event was sponsored by Stewardson American Legion Post 611.